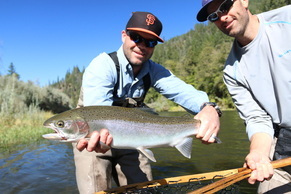 Join us for a fly-fishing adventure in the late summer/fall as the steelhead enter the Klamath and its tributaries. We have several world class fly-fishing guides who are licensed and instructor certified through the FFF. Adventure Whitewater operates as Jefferson Flywater for its fishing trips. Please visit our fishing site for more details by clicking here.